While in Berlin in May, I had the opportunity to visit the American embassy, a metaphorical and literal bastion of American power. I do not normally go out of my way to visit American governmental establishments and submit myself to the scrutiny of humorless and self-important functionaries, but I wanted to visit that part of Berlin and was naturally curious about our diplomatic fortresses in the age of terror. The trip was one of the excursions scheduled by our (and Stanford’s) man in Berlin, who had frequent dealings with the embassy. 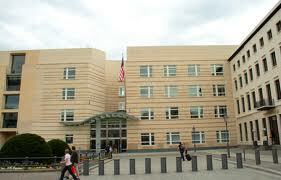 I was consequently restrained in my comments in the embassy. 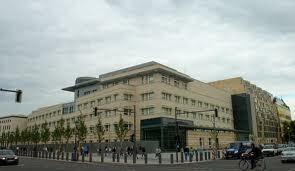 The embassy is about as centrally located as one can be in Berlin. It sits immediately to the south of the Brandenburg Gate on the corner of Behrenstraße and Ebertstraße, about 300 meters from where Hitler died in the bunker and more importantly, about 400 meters from the Bundestag (former Reichstag), the German federal parliament. 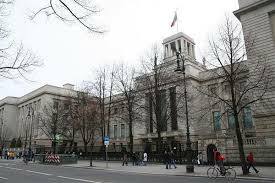 Since the Berlin government defiantly refused to allow the Americans to block off streets in the center of their city the embassy is hardly aesthetically pleasing, inasmuch as it had to be built as a fortress to satisfy America’s growing paranoia. Surrounding the compound is a ring of low concrete pillars, designed presumably to stop any car bombs. Entering by the south door, we – a collection of former Stanford students in their late 60s – of course had to go through American airport type security in order to reach a conference room that was undoubtedly the only place accessible to guests in that part of the building. Naturally, this was all a very serious process, as the possible terrorists were grudgingly admitted to their own embassy. The paranoia, incidentally, extends to the office of the ambassador himself: his own personal staff members are required to leave everything outside when they enter. By way of contrast, I have heard that security at the Russian embassy is incredibly slack. Now, that is a fine irony. To my immense surprise John Emerson, the ambassador for the last year, popped in to chat for a while. I never thought I would actually meet an American diplomat, not that they would have anything interesting to say unless they were career State Department people. Perhaps he had the time for us because we were Stanford graduates and thus opinion makers in our communities. More likely it was because no one besides the British diplomatic staff would talk to him because of the NSA snooping. My first thought was to ask him how much money he raised for Obamas in order to get the job, but I did not what to injure our friend’s relationship with the embassy. I later learned that he did indeed raise several million for the President’s campaign, hardly surprising since that is how most ambassadorships are handed out. All the Russian ambassadors in Europe are career diplomats and speak the local language. But he did seem to know a little about Germany. He left after a short while, probably to go get slapped around by an obviously annoyed German Chancellor, and his place was taken by an expert on Eastern Europe, doubtless chosen because of her ability to deftly sidestep embarrassing questions. Right off I asked her if staff who talked to visitors received political instruction, and she of course answered that they did not and all had their own opinions but of course had to be on the same channel (or some such metaphor). In her answers to our questions she then proceeded to spew the exact party line of the administration and artfully dodge questions that could not be honestly answered without departing from that line. Since the NSA was in the air (literally) she dished out the standard fare on the subject: Snowden of course needs to be brought to justice for his crimes and god knows what he is telling the Russians (Why else would he be there? ), but it is good to have an open dialogue on the subject. As usual no mention was made of the fact that without Snowden there would be absolute no dialogue and no knowledge of what the spooks were doing, and perhaps he was in Russia because it is one of the few places he could not be kidnapped by the CIA. And all the while, equipment on the embassy roof was monitoring the conversations and electronic traffic of the nearby German government. It was all I could do to refrain from loudly voicing my indignation and opinion of her and the government she represented. 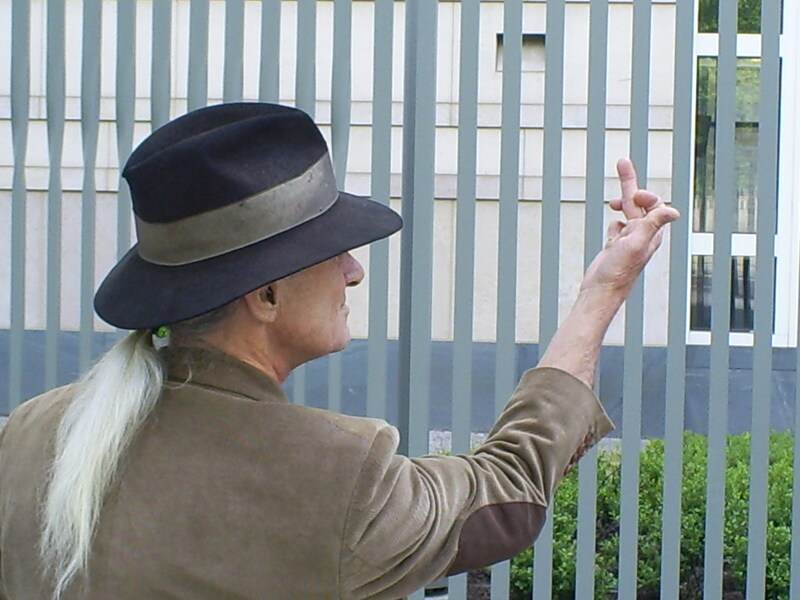 An obscene gesture directed at the embassy from the sidewalk was the only protest I could make. When I was in Berlin 50 years ago, I was actually proud to be an American. Long, long ago Stanford University maintained branch campuses in several European countries, including West Germany. From June to December 1964 I was a member of Group XIII, along with about 80 other students. 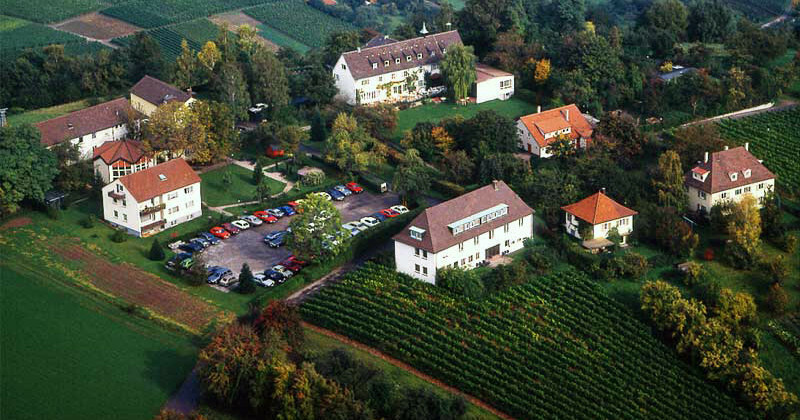 The campus was at Landgut Burg, an old estate on a hill above the village of Beutelsbach, just east of Stuttgart. We took regular Stanford classes and one hell of a lot of German and were adopted by local families, accustomed to the gaggle of young Americans that arrived at the Burg every six months. We were all young, very young, ranging from 18 to 21, and we were not just Americans, the Masters of the Universe, but we were also Stanford students, the best and the brightest. To varying degrees we were naïve, relatively well-off and arrogant. We stood out simply because of the way we were dressed, and we knew the latest popular music and dances. We were proud to be Americans, and many of us, certainly myself were stupid, a facet of being 18 years old, I now know. For most of us Stanford-in-Germany was an introduction to a wider world. Many of us were in a foreign country (at least other than Mexico) for the first time, and in 1964 Germany was still a foreign country, a taste of old Europe. Most Germans spoke German. Chasing German girls generally meant pursuing them in German, a strong motivation to learn the language. We were of course also in a place where we were adults and old enough to drink. And drink we did. Reading my diary from that year, I was surprised by just how much beer and wine swilling there was, at least until the novelty of legal alcohol wore off. Then we continued to drink a lot anyway, because that is what college students do. I was amazed to discover just how many classes I, the normally oh so responsible student, cut in order to drink and court. It appears that I spent almost as many evenings at my favorite watering hole as at the campus, which naturally put a bit of a squeeze on my classwork. There was a small informal gathering of Group XIII alumni at Stanford some several decades ago, but after graduating in 1967 I essentially did not see any of these people again. Until a few weeks ago. A fifty year reunion in Germany (no more West) was organized, and since Landgut Burg is now a hotel, we were able to actually stay on the old campus. The old buildings were we lived and attended class were renovated but still there, allowing us to seriously savor those experiences of fifty years ago. About half the people who made up Group XIII attended. This was an exercise in nostalgia. Back to the land of one’s youth, the happy highways where one went and cannot come again. 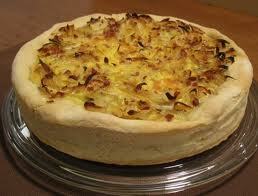 The downside, of course, which did not seem to bother the others, is that fifty years have passed. In 1964 we were all young, and the future stretched ahead, filled with hope. America was at its apogee, and a citizen could be proud. Now, we were old, retired, with grandchildren, and if one had not done it yet, it was not going to be done. Germany was no longer the poor relation; we were. Our country was now in decline, the recognized bully of the world. It was all a vivid reminder that things change in a half century. 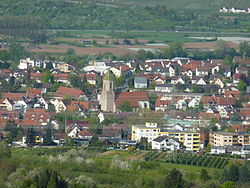 Beutelsbach, the village at the foot of the hill, had not changed all that much. 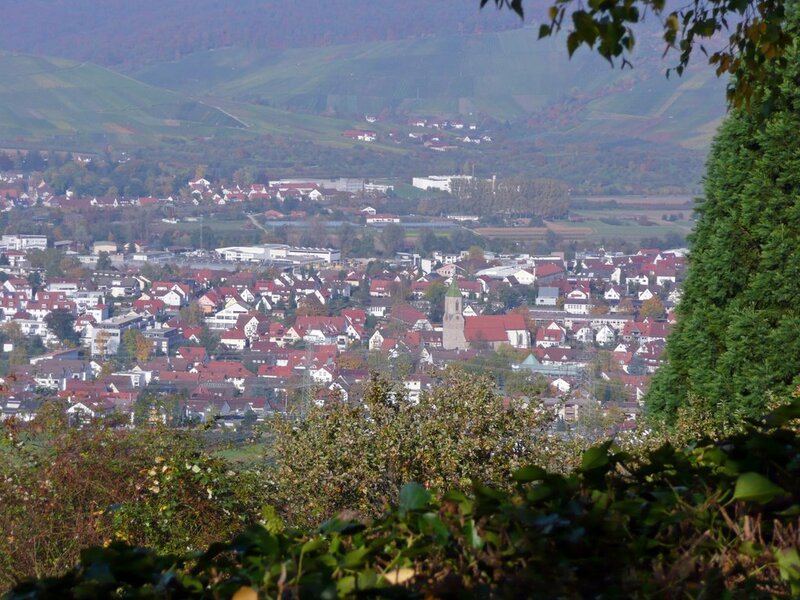 It and four other villages had coalesced into the city of Weinstadt, but it was still familiar to us. Stuttgart was extensively rebuilt, but it was still the city we remembered – or thought we remembered. It was we who changed. I could still see the young students under the wrinkles and grey hair, but most of us had grown up, probably I the least of all. We were no longer students but doctors, attorneys and professors, groups not traditionally known for drinking and raging. In 1964 most of us smoked; now only three of us did: I and another couple, my Rauchenkameraden. Even in the still familiar confines of the Rems valley, where Weinstadt is located, it was clear that Germany was a different place. It was no longer old Europe. No more piles of manure outside houses in the villages, no more horse drawn vehicles and far fewer people speaking the incomprehensible Swabian dialect. Immensely wealthy, the country is no longer a bargain, and where we once got four marks for our dollar, now we got only three-quarters of a Euro. We now looked no different from Germans, and our pop culture edge had completely disappeared. And apparently everyone in Germany now speaks English. It does get a little annoying being around crowds of people who speak at least two languages. That fifty years is a long time, however, was nowhere more obvious than in Berlin, where about half of us spent a second week. In November of 1964 we took a field trip to Berlin, then the front lines of the cold war. The Wall had gone up only three years earlier, and West Berlin was a neon island in the socialist sea of the German Democratic Republic. For us the center of town was the Kurfürstendamm in Charlottenburg, and Checkpoint Charlie and access to the western marches of the Soviet empire was way off to the east. The Ku’damm was alive, filled with shops and clubs and open 24 hours. By contrast East Berlin was a tomb, seemingly closed at night; there was still some rubble from the war two decades earlier. 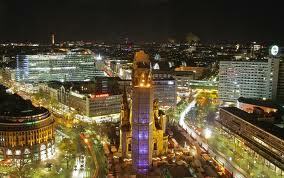 Berlin was almost literally a city in film, the West in vivid technicolor, the East in black and white. A quarter century later the Wall, the DDR and the Soviet Union itself were gone, and Berlin then had another twenty-five years to rebuild itself before we visited again. It might have been a completely different city. With the fall of the Wall the city center moved east to where it was before the war, and our hotel was near the Alexanderplatz, now one of the major candidates for the “center of town.” The Ku’damm is now a relatively quiet neighborhood way off in the west, and all the action is in what was once the mean streets of East Berlin. Our major landmark and point of orientation, the Wall, is gone, along with the checkpoints and expanses of no-man’s land. The only obvious traces of the former capital of the DDR are the prefabricated apartment blocks and the streets named after German socialists. This Berlin, the once and future capital of Germany, is fun and extremely engaging, especially for an historian, but it can hardly match the Berlin of five decades ago. 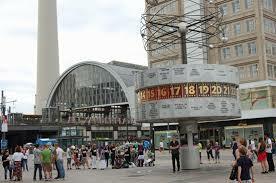 The Berlin of 1964 was a large scale piece of cold war performance art, history encapsulated in single city. In old West Berlin, the showcase of the free market world, there was a vibrancy, an intensity, an edge that certainly no longer exists – that can no longer exist. And it was the Berlin of an eighteen year old student, which brought its own intensity and edge, and that too can never again be regained. For me Berlin was emblematic, a vivid reminder of lost youth. And it was a full circle of sorts. I remember the young and undecided student standing in awe before the altar in the Pergamon Museum, and now the retired classical historian has done the same, with far more cynicism but with the same awe. Herr Wachtmeister, Wo Ist der Dom? Let me make it clear immediately that I am not now nor ever have been seriously engaged in German Studies, most certainly not as a scholar. I am a classical historian, and German has for me essentially been simply a tool in my examination of antiquity. But one can hardly study the German language without being exposed to some degree to German literature and culture, and I have in any case long been in love with things German. The intent of this piece, then, is not a sober march through some aspect of German Studies but rather a somewhat less than serious meandering about the edges of die Deutschkunde. When I entered high school and was required to choose a foreign language, there was absolutely no question. French and Spanish were the languages of wimpy second-raters, and why in the world would anyone want to study a useless tongue like Latin (an ironic assessment given what I ended up doing for a living)? No, German was the cool language, if only because it conjured up images of the Wehrmacht, and in any case I knew it was also the language of science, and that was where I was headed. I thus found myself, along with many of my brainy (or nerdy) friends, in Jens Shurk’s first year German class, where we quickly discovered from our new dictionaries that the teacher’s name was seemingly an anglicized version of Schurke! And so my career of insufficient respect for authority began, literally auf deutsch in this instance. 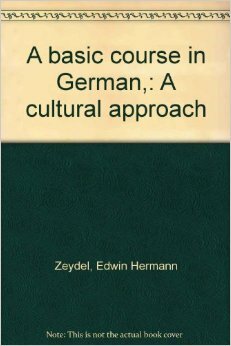 In four years with Herr Shurk I went through all of Zeydel’s A Basic Course in German, published in 1951, which meant that to a good extent it was illustrated with photos of a Germany that no longer existed and seemed in any case to have no history between 1930 and 1945. The German in the second half of the book was printed in Fraktur, which certainly looked cool but seemed of limited use to a student who had no idea that he would be reading nineteenth century German historians. Zeydel was an uninspiring book of the Ich bin Walter, du bist Marie variety (and did not list coolness as one of its reasons for studying German), but just learning German was a heady enough experience, and Shurk, who had been stationed in Germany and married a German woman, soon began exposing me to perspectives on German culture that extended beyond Teutonic knights and the Third Reich. Most important for me was Richard Wagner, the operas of whom Shurk, a true Wagner freak, played in class under the somewhat specious pretext that they were in German. I wonder about the linguistic value of this practice, given the frequently bizarre nature of Wagner’s German, but while the other students were passing notes or dozing off I was beginning a lifelong love affair with die Zukunftsmusik. The poetry of Christian Morgenstern, the other delightful discovery out of high school German, was a pleasure gained only through laborious translating; the Ring could be absorbed directly into the bloodstream. And it has provided for the effortless acquisition of poetic German handy for all occasions, such as the announcement of a pregnancy – den hersten Helden der Welt hegst du, o Weib, im schirmenden Schoss – or a query about the style of one’s eggs – weiche, Wotan, weiche! The Shurkjahre provided me with a basic grounding in German and a growing appreciation for the more noble aspects of the Kultur, but for all the club meetings, class discussions, German dinners and movies, actually speaking German remained elusive, as did the legendary Sprachgefühl that Shurk promised would one day descend upon us like a blessing from on high. The opportunity to learn actually to talk the talk came in college, where despite abandoning science as a vocation I continued with German (advanced placement!) as a minor to my ultimate degree in ancient history. This provided a broader and deeper exposure to German literature, which ranged from the tedious (Mann) through the cool (Borchert) to the wonderfully absurd (Dürrenmatt). The down side to this great reading, of course, was that it was in a bloody foreign language, though my concurrent study of Greek and Latin increasingly made German seem a language of stark simplicity. Far more important was the opportunity to attend Stanford-in-Germany, easily the best thing Stanford University provided me (apart from the piece of paper that got me the piece of paper that got me my faculty appointment). In June 1964 I left California for the first time, heading with some eighty other students for sixth months of classes at the Stanford branch campus in the village of Beutelsbach outside Stuttgart, which has subsequently swallowed it. Actually, the “campus” was ensconced in the Landgut Burg, perched on a hill above Beutelsbach, to which we could descend like visiting nobility in order to observe their quaint ways and try their rustic dishes, like Zwiebelkuchen and Spätzle. And their ways did strike a group of American eighteen to twenty year olds as quaint. This was 1964 and Germany and Europe were not yet completely awash in American culture and goods, and consequently one instantly felt he was in a foreign country rather that a German language version of the United States. This was especially so for peer conscious college students with their serious concern for what was hip and now. There were of course the vanishing traces of an older and more rural Europe – the resealable ceramic-capped beer bottles, the unshaven legs and armpits, the smell of the Misthaufen, horse-drawn vehicles – but what struck us most was our young German counterparts, who were in our arrogant estimation most definitely not hip and now. Their dress, their rock ’n’ roll and their dancing, the things that really mattered, were all several years out of date (eastern Europe was like a trip into the fifties), which convinced us more than anything else that these people were provincials, an irony that I can now appreciate. Certainly not provincial at all in our underage eyes was the eminently sensible European attitude towards alcohol, which suggested that if you were old enough to vote and be drafted, you were old enough to drink. 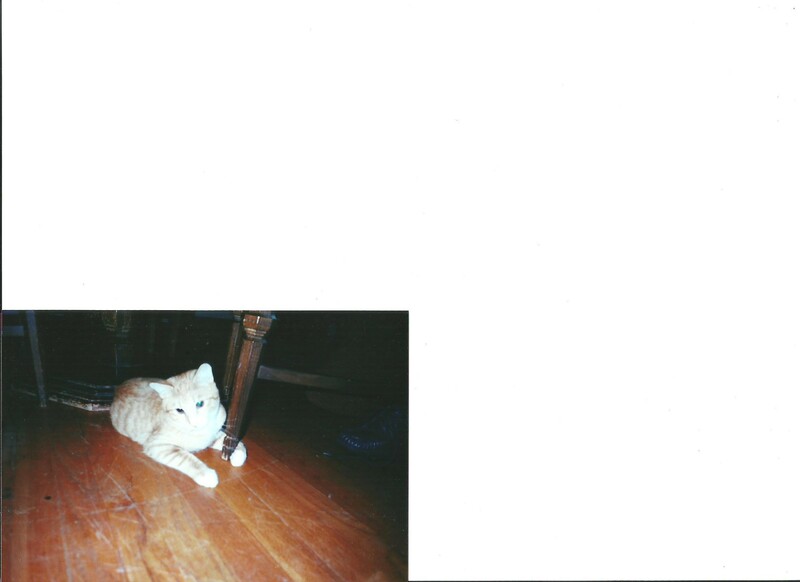 This resulted in an initial period of frequent inebriation, but the novelty wore off soon enough for most of us. There was a Ratskeller right bellow the classroom, but most preferred the experience of drinking in a foreign language and enjoying that almost unique German institution, the Gasthaus. Climbing back up to the Burg after a bout of Stein-lifting not being to my taste, I frequented the Gaststätte Hirsch in Eichelsberg, where under the tutelage of Hermann the Wirt and his wife I learned a great deal of the Volksbrauch, at least when it came to swilling beer. On a couple of occasions Hermann (whom we called ihr because of his size) brought a bottle of American whiskey after closing and crushed the cap, an indication that this was likely to end up a Kotzenabend. As I said, the periphery of German Studies. At the Burg we had classes four days a week. We were divided into five groups by level of German, and since I had so much in high school I was put in Gruppe A, also known as the Wunderkinder, which included several native speakers. The seminars were consequently conducted entirely in German, which meant initially that for the first time in my life I did not have much to say. The other classes, economics and German philosophy, were taught in English, though the English of the German professor who taught the latter was certainly novel. Among other things he constantly spoke of “three-angles” and often began by saying “From begin on…” We never had the heart to correct him. It was, incidentally, in that class that I first read a non-mathematical book that I simply could not understand, Husserl’s Cartesian Meditations. Consider the following sentence: “The universal Apriori pertaining to a transcendental ego as such is an eidetic form, which contains an infinity of forms, an infinity of apriori types of actualities and potentialities of life, along with the objects constitutable in a life as objects actually existing.” You said it, Edmund! But the whole point of the program was to get one off the campus into the bosom of Germany and its culture, so we were more than encouraged to travel on those three day weekends. My first trip was with some students who had a car and we visited Munich (with many jokes on the way about Ausfahrt and Einfahrt), where I had the exquisite opportunity to use a stock phrase from Zeydel that had been a constant joke back in high school German. We could not find the cathedral we wanted to visit, and I thus approached a policeman and asked “Herr Wachtmeister, wo ist der Dom?” That was truly a verweile doch moment for me. I subsequently traveled alone, hitchhiking, in order to pump up my German, and this did the trick, since as is clear from what I did for a living, I really like to talk. The flubs were part of the fun, as when I was telling one of the Dienstmädchen, Helga (die ewige Weiblichkeit zieht uns hinan – und hinein, especially when you are eighteen), about World War I ace Rudolf von Berthold: Er hat vierundvierzig Flugzeuge geschissen. An incredible accomplishment, when you think about it. Not everyone spoke the German I was familiar with, however, inasmuch as regional dialects were still running strong. We certainly struggled to comprehend schwäbisch, though it was soon discovered that one could fake speaking it by adding –le to the ends of sundry words: Grüβ Gottle! (Much later I learned the reply and was able to use it in the Himalaya when a German hiker greeted me with Grüβ Gott: Wenn ich Ihn sehe!) I had frequent conversations with an old man who seemed always to be leaning out his window when I visited Beutelsbach, and I don’t think I ever understood a tenth of what he was saying. And schwäbisch was nothing compared to Schwyzerdütsch. One weekend I visited the departed Helga in St. Moritz, and the locals might have been speaking an entirely alien language. In fact, some of them were. I happened to be in one of the very few places where they spoke Romansch, apparently a vestige of Latin and the Roman Empire. I wonder about a country that can not decide what its national language is. My conversational ability nevertheless developed steadily, and after a couple of months I suddenly realized that I was sometimes speaking German without thinking about it, that I had developed some instinctive sense of what was correct and what was not. I even began to notice grammatical mistakes made by native speakers. The legendary Sprachgefühl had come upon me! The entire group took field trips. Paris was certainly fun, but Prague was much more beautiful and certainly more interesting. This was Warsaw Pact territory, our ostensible enemy, though that hardly seemed the case with all the Czechs I met, and as a workers’ paradise everything was so cheap that many mothers, including mine, got that European crystal they had been dreaming about. On the other hand, one of the students later tried to smuggle a Czech friend to the west in his car and for two years got see the Czech penal system up close and personal. 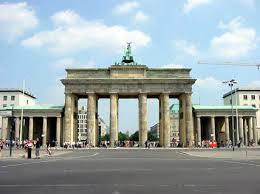 Easily the most exiting trip was to West Berlin. This was the front line of the Cold War, and the juvenile enthusiasm we had demonstrated in Stuttgart, Paris and even Prague was suddenly tempered in sight of the wall, which had gone up only three years earlier. There is something about tanks and soldiers with assault rifles that takes the fun out of stealing street signs. A showcase for the west and capitalism, West Berlin was like a city on amphetamines, wired up day and night and ablaze with neon and a terrific place for young Americans who couldn’t get into a night club back home. For me of course this was also the capital of the Second and Third Reichs, a place that oozed history, and I spent a lot of time imagining the Red Army advancing on the Tiergarten or the final events in the Führerbunker. Well, perhaps not as much time as I spent watching the girls on the Kudamm. 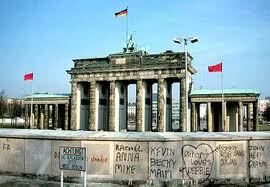 East Berlin was in some sense also a showcase – for the failure of socialism. There were, amazingly, still blocks of rubble from the war, and a notable absence of many sorts of goods in the stores. But the people, even some of the Vopos, were friendly, and on my first trip over I was invited to a family dinner, though they did ask if I might bring some fresh fruit when I came. When I returned that evening, a female border agent on the east side of Checkpoint Charlie looked at my bag of oranges and asked in all seriousness: “Haben Sie eine Pistole versteckt?” Visions of Rosa Klebb in my head, I stammered out a nein and watched a huge grin appear on her face. 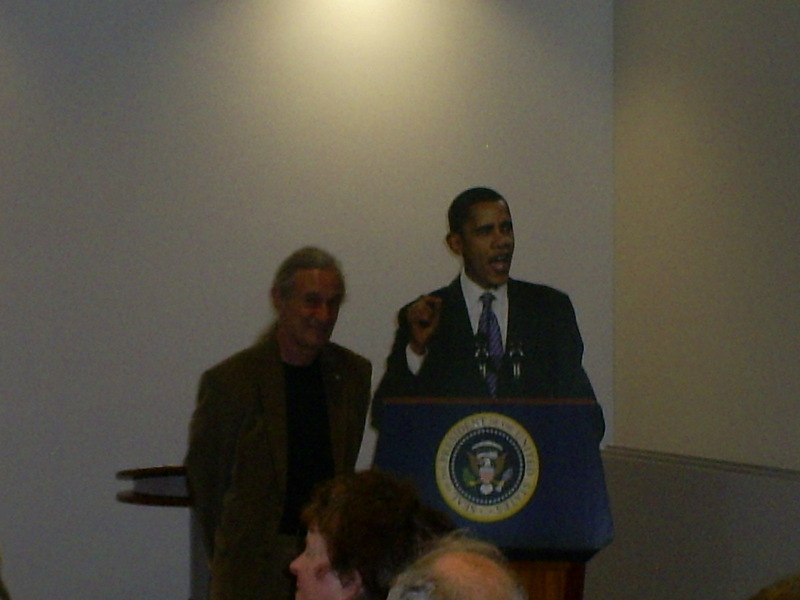 Here was an evil commie functionary with a sense of humor, something, as I discovered on later travels, that was conspicuously absent from American customs officials. For convenience I normally passed through Checkpoint Charlie, but in order to experience what ordinary Germans endured I once crossed through Bahnhof Friedrichstraβe and had one of the more unforgettable moments of my life. I got separated from my friends and had to wait an hour on the east side for them. The sun had already set, and sitting outside on a bench, I saw a squad of perhaps a dozen Vopos marching down the darkening street. Watching them in their black uniforms with their jackboots kicking up in the goosestep, I was suddenly transported into the past. All that was missing were the swastikas. Heavy stuff for an historically inclined eighteen year old. 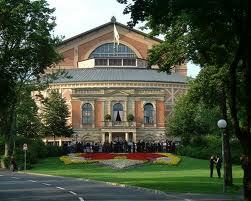 The grandest single moment of the entire half year in Germany, however, came on my pilgrimage to Bayreuth. I arrived on the day of the last performance of that year’s Festspiel, but knowing that tickets had been sold out since before Wagner’s death, I expected only to see the Festspielhaus, Haus Wahnfried and the graves of the Master and Cosima. But for the hell of it I went to the ticket office, and a ticket had come back! There were four people ahead of me, but for one reason or another they turned it down, and I realized that I was about to see (for about $15) Götterdämmerung at Bayreuth. Eat your Herz out, Jens Shurk! From then until the opera began I was floating several feet above the ground, watching the opera jet setters in their sometimes antique formal wear while they watched me in my not so formal wear. The production was by Wolfgang rather than Wieland Wagner and thus not that great, but who cared? I was in a box right next to the one Wagner and Mad Ludwig had sat in, and at the end of the performance the actual grandsons of the vile genius appeared on the stage. The ovation went on for the better part of an hour, and my hands were sore from clapping and my voice hoarse from yelling. I expect that I am the only person ever to have yelled “Bitchin’!” in the Festspielhaus. Before I departed Germany in December for the Kindermädchenstaat I stayed a week with a German family in Schorndorf, a whole new experience in Haushaltskultur. I knew Germans did far more handshaking than we, but I was astounded to witness the children in the family shake hands with their parents before retiring for the night and upon greeting them in the morning. My guess is that this custom has evaporated as Germany has evolved – unfortunately – into a less formal society in the last three decades. Also enlightening was a trip with one of the boys in the family to his Gymnasium, where he studied a curriculum that would baffle many of the undergraduates in an American university. His English teacher was delighted to have a native speaker in the class and had me read the text they were preparing. Perhaps not so surprising to me after a half year in Germany, I was periodically interrupted by the instructor, who would point out “That is the way they say it in America. Here is the way it should be pronounced.” And I had thought I spoke standard, non-dialectical English. My time in Germany in 1964 was clearly the high point of my tenuous association with German Studies, but I did visit the Vaterland again. In 1979 a sort of circle was completed as I traveled to Germany (and other countries) in the company of Herr Shurk, who thus had the opportunity to hear one of his former students actually speak passable German. In return I got to meet his wife’s family in Mainz (Gel! 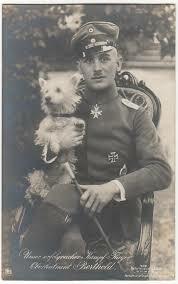 ), including her father, a former Gauleiter (cleared during the denazification) now in his eighties. My historian’s heart was of course excited – a living relic of the Hitler government – but he was disinclined to talk about the old days. Less lofty, perhaps, was my return in 1984 with my brother, whose German was at the Bier gut! level. 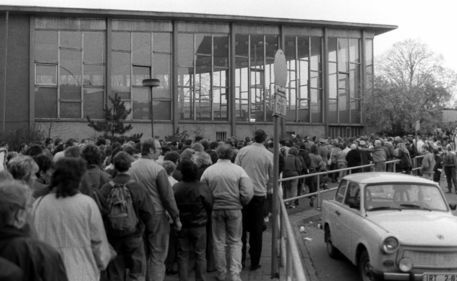 The Burg was now a sort of convention center, the Stanford-in-Germany program having expired from lack of student interest, yet another sign of the decline of higher education in the United States. In Munich I insisted we visit the Hofbräuhaus, since I had been there exactly twenty years earlier to the month and every beer drinker should stop in at least once in his life. Just an hour or so in the afternoon for nostalgia purposes; we staggered out after midnight, so schön ist’s im Hofbräuhaus! Meanwhile, German had for me become less the language of literature and beer halls and more the Gelehrtensprache, as I obtained a doctorate in classical history. The language I had as an adolescent thought useful for science turned out to be along with my mother tongue the most useful for studying antiquity. It was after all the Germans who invented “scientific” history (“wie es eigentlich gewesen ist”) in the nineteenth century, better to examine the classical world they had fallen in love with in the eighteenth. Moreover, German can be just perfect for the nitpicking so dear to scholars, especially those in Classical Studies. Was the Peloponnesian League a Staatenbund or a Bundesstaat? This sort of elegance is impossible in English. It is hardly surprising that the most monumental work in classical history, at least in terms of size, is in German: Pauly, Wissowa, & Kroll, Real-Encyclopädie der klassischen Altertumswissenschaft. This was a project that lasted longer than the Second and Third Reichs combined. My conversational ability has gone dormant in recent years, requiring a one or two week dip in a German-speaking environment to revive, and I have not returned to Germany in twenty years. But I have of late spent a lot of time in Greece, and German has frequently stood in for my non-existent modern Greek, since there are so many middle-aged Greeks (and Italians and Turks) who speak German from their days as Gastarbeiter. Besides, Germans and Austrians have the tourist Euros to spend, which more than compensates for any hard feelings left over from the forties, and many shops and restaurants sprechen Deutsch. Indeed, every summer there is a mini-Indo-European invasion, as Germans, dragging their Wohnwagen behind their Benzes, stream into the Adriatic and Aegean, seeking the sun and bargains. And if you fly into Athens, you pass through an airport built and for the next thirty years owned by the Germans. Here in Albuquerque, the land of Karl May, my dance about the fringes of German Studies is maintained through my friendship with Peter Pabisch and Fritz Cocron, a Dolmetscher on the Ostfront (more living history) and possibly the only Wehrmacht veteran ever to be decorated by the Polish government. Our conversations are for the most part in English, but snatches of German nevertheless slip past my lips on occasion and Sprachgefühl appears with me still, ready to be awakened by a sojourn in Germany. Mein Sinn ist in Griechenland, aber mein Herz bleibt immer in Deutschland.